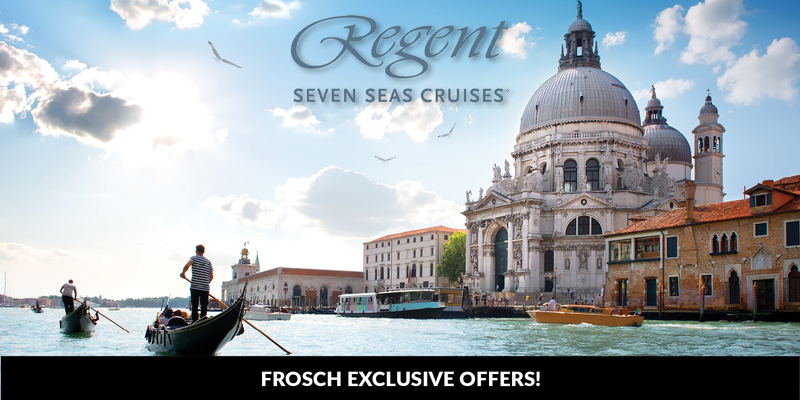 FROSCH Exclusive Offer with Regent: Double Shipboard Credit + FROSCH Advantage Pricing! Aboard an award winning fleet, you will enjoy cruising how it was meant to be – in all-inclusive luxury – with RegentSeven Seas Cruises. Savor the warm and friendly ambiance with the ultimate expression of elegance and enjoy the perfect day, every day of your cruising vacation with Regent & FROSCH. FROSCH EXCLUSIVE OFFER: Book select cruises during the month of April and receive a DOUBLE Shipboard Credit – up to $1000 per stateroom! Plus, enjoy the FROSCH Price Advantage with lower pricing on a variety of in-demand cruises! These prices are so low, we can't advertise them online -- contact your FROSCH Travel Consultant for details!